FLOW-3D CAST provides a complete flow and thermal solution for a wide range of metal casting processes. The simulations provide detailed insights into filling and solidification of the cast part while tracking various defects like different types of porosity, surface oxides, entrained air and collapsed bubbles, thermal stresses and deformations and more. Metal casters can also analyze the mold or die thermal profiles and other properties like gassing of cores with FLOW-3D CAST. Optimized simulated designs reduce development time on the plant floor, speed up time to market and increase yield. FLOW-3D CAST enables modelers to save on design and development costs when deploying new casting processes or alloys. Yes, I’d like to receive the latest CFD news. 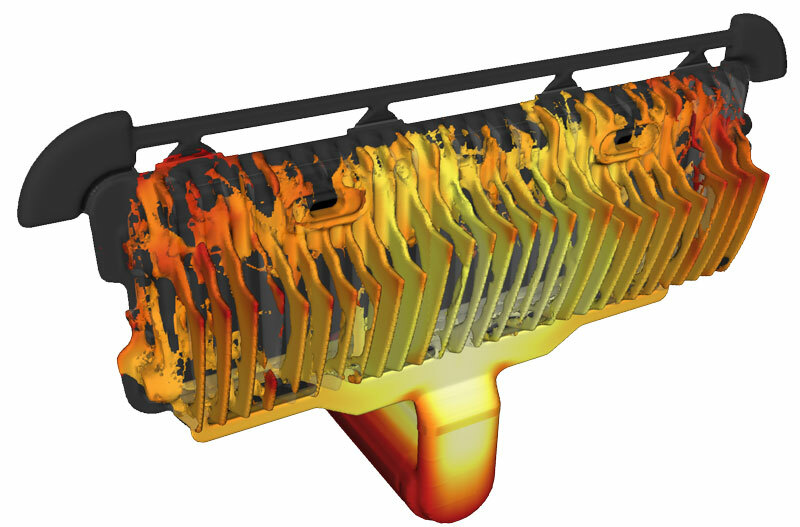 Metal casting applications are some of the most challenging simulations to run accurately. The complexity and range of the physics involved, the modern challenges of thin-walled castings, and ever increasing sophistication in foundry equipment deploy the full range of FLOW-3D CAST’s solver versatility and power. FLOW-3D CAST is designed to help engineers navigate through the simulation steps in a simple, logical sequence that closely follows key processes. Sand casting, LPDC, HPDC, lost foam, centrifugal and permanent die all have their own dedicated modeling workflows within the FLOW-3D CAST‘s user interface. FLOW-3D CAST’s highly accurate flow and solidification results capture critical casting defects including surface oxides, entrained air, macro- and micro-porosity. Other unique modeling capabilities include thermal die cycling with the ability to model robotic spray cooling and lubrication, shot sleeve flow profile, squeeze pins and thermal stresses.